Cristina is a pharmaceutical industry veteran having held various positions for the past 17 years. She is the current Head of Diversity & Inclusion and Equal Employment Opportunity for North America at Sanofi. In this role she leads the human healthcare company’s North America efforts to maximize the power of difference within, enabling a culture where employees are engaged, empowered and included. 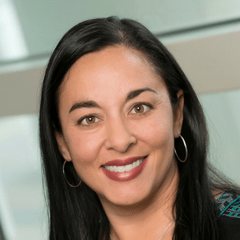 She first joined Sanofi as Head of Multicultural Marketing for Diabetes and Cardiovascular, focusing externally to ensure thoughtful and intentional inclusion of diverse patients and the customers that care for them in all marketing efforts. Prior to joining Sanofi, Cristina worked in a number of key commercial roles in the areas of Global Oncology Commercial Excellence, U.S. Sales Leadership, Product Marketing, and Training & Development. Her passion for D&I sprung from years of devoted energy to global and local council work and leadership of several employee resource groups. She holds a strong belief that in order to achieve significant impact we must invite the majority to the conversation, not just those traditionally underrepresented. This is a strong focus, along with efforts to enhance diversity and amplify inclusion at Sanofi. Her mantras: “See a need, fill and need” and “be the reason for the exception” have been driving forces for many of the opportunities she’s earned. A proud wife and mother of four children that always keep life fun and interesting, she was also recognized in 2012 as a “Working Mother of the Year” in Working Mother Magazine.